I recently attended a UX Design conference hosted by Nielsen Norman Group. One of the classes I took broke down the design thinking process and solely focused on the user empathy and ideation phases of that process. The traditional cycle of a design thinking process. Image from NN/g. The portion of the design thinking process my class focused on. My team and I were tasked with improving the experience of buying a new TV. We've all been there: ready to make a purchase, but unsure of what it is we really need, or what all the terminology means. This can all feel overwhelming and leave a lasting thought for some if they really got a good deal or if they wasted money on something they don't actually need. Fortunately for my team, we had access to several diary studies written by real individuals who were in the process of buying a new TV. The diary study conducted shed some light on the unique needs of each individual and my team was split into smaller groups to each focus on one of the case study participants. Carol Ann was the study participant my team focused on for the duration of the workshop. We started by building an empathy map based on her diary entries. Once we had identified her thoughts, feelings, actions, and what she is saying, we were able to create an As-Is Scenario Map of her TV buying process. Following a similar format to a journey map, the as-is scenario map extrapolated the details from our empathy map in a timeline as Carol Ann researches TVs, compares them, decides on the one she wants, and ultimately buys one. The journey map my team and I created, based on the information we used in Carol Ann’s empathy map. It was with this visualization we were able to highlight pain points seen in the clusters of ideas from other team members. A higher concentration of sticky notes shows a greater chance of friction, or satisfaction in Carol Ann's process. In our observation, there was a great deal of friction in the compare and decide phases of her TV buying process. "Carol Ann, the Netflix Enthusiast, needs a way to confidently choose the TV best for her, so that she can entertain friends and families for years to come." The need statement my team voted on. Now that we had fully immersed ourselves to solve Carol Ann's problems, we began to apply this understanding to rapid idea generation. Everyone on my team generated about three ideas each: two practical and one that was really outlandish. We built on these ideas until they were polished and ready to be prioritized for consideration. These are some actual ideas my team and I came up with during our ideation phase. Can you tell the difference between the practical and the outlandish? 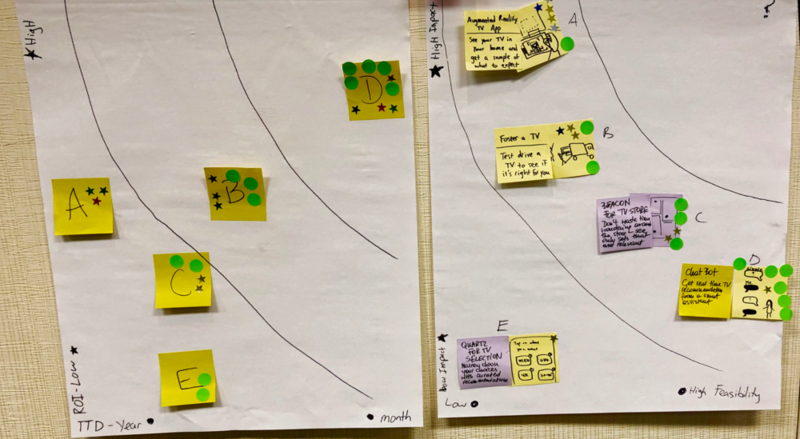 Our last phase of the workshop focused on prioritizing our refined ideas to see which ones stood out as a high impact to the user at a high feasibility for us. As a team, we voted on the feasibility and impact to the user our ideas had, using two sets of stickers. Then we plotted each of the ideas on a prioritization chart. At first, we didn't see any home runs with our initial plot. This can be resolved by assigning a weighted vote or simply allowing more votes per person. However, we decided to vote again, this time based on the time it would take to develop and the expected return on investment. After plotting our ideas under this new prioritization we determined that a chat bot may be a viable option to help Carol Ann with her TV comparisons and final decision. Our exercise ended here, but I intend to take the prompt further in the future. I plan to incorporate other parts of our ideation phase with the chat bot. Another idea we had was an augmented reality experience that allowed Carol Ann to visualize the TV in her own space, and it seems like a good starting point to work with.